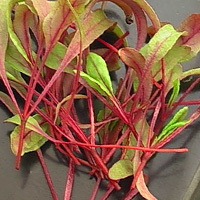 Microgreens also called micro Benitade or Metade in Japanese are micro greens used in Sashimi dishes and as a side dish in Hiroshima Japan. Varieties of matade include: red water pepper benitade and blue water pepper. Microgreen seeds may be mixed with wasabi. The calories in Micro-greens per 5g(1hand) is 2 calories. Micro-greens is calculated to be 43Cal per 100 grams making 80Cal equivalent to 186.05g with 0.44g of mostly carbohydrates、0.15g of protein、0.03g of fat in 5g while being rich in vitamins and minerals such as Vitamin K and Manganese.